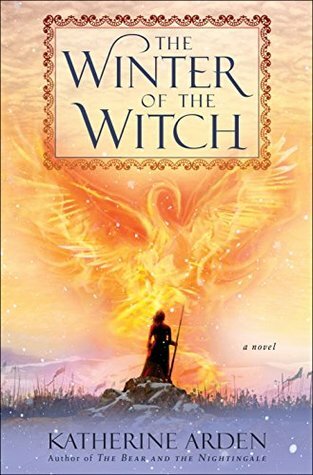 The Winter of the Witch begins just moments after the events of The Girl in the Tower. There is really no way to write about the plot of this book without giving a lot away about its predecessors. As usual, the story moves at a breakneck pace and Katherine Arden manages to include an incredible amount within the covers of this book. Throughout these three books, Vasya is a woman torn between realities: she lives within the walls of Moscow, but yearns for the Russian countryside; she is committed to protecting her family, but also compelled to return to the frost demon Morozko; and she is pulled between the religious traditions she grew up with and the knowledge that magic is real and she has a powerful gift for it. All the threads from the previous two books come together here and it is impressive to see that no character or plot point was haphazard. In the midst of this, Arden introduces new characters and new facets to the magic we thought we understood, and it works beautifully. Vasya has always been a compelling character. She is talented and committed, but she is not immune. In Winter of the Witch, we see that there is a cost to bravery and there are consequences for you and those you love when you run into danger instead of fleeing from it. She is determined to forge her own path, but she quickly learns that her understanding of both human politics and the history of magic are limited. It's a fascinating to watch Vasya realize her potential and then learn when to act on her own and when to ask for help. In this series, Katherine Arden has achieved something remarkable. Her characters are easy to love and readers will race through the pages to find out what happens next all the while lamenting that they are reaching the end of the story. Each of the books in this trilogy is teeming with Arden's love for magic and Russian folklore. I can see myself returning to Vasya's adventures each winter, happy to be reunited with these characters and the possibility that magic might be just beyond those trees in the dark, cold forest. I can't wait to read this book - I'm so glad to see all the good reviews, especially from people who loved the first two. It's really hard to write a trilogy where all three books are this good. I love this trilogy so much! I have this book right next to me on my nightstand, but I am nervous to read it. I get too attached to characters - like Solovey! I am a little anxious about what could happen to him in this book. I don't want to give anything away, but just hang in there! It's a good story and I think Arden knows how we love all the characters.